A Duke Nukem movie is in the works and the movie's producers have dished some details on their approach to adapting the popular video game franchise for the big screen. Tomb Raider didn't wind up being what many of us hoped it could be, so we're still waiting on an inarguably and distinctly good video game movie to be made. While Duke Nukem presents a lot of challenges and appears to be in the very early stages, it's one project on the burner in Hollywood hoping to break the curse. Now, producers Andrew Form and Brad Fuller have opened up a bit about the project. Andrew Form and Brad Fuller, who work with Michael Bay's Platinum Dunes production company, are currently promoting their new movie A Quiet Place, which is getting rave reviews thus far. In a recent interview, they were asked about the Duke Nukem movie and, while they couldn't say much, since the script is still being written, they talked about their approach. Specifically, how they want to nail the tone in the same way Deadpool managed to. Here's what Form had to say about it. "We are working on Duke Nukem right now. It's going to be about tone. That's about tone. How do you nail that tone in the way that Deadpool nailed the tone? I think we have to do that and if we don't get the tone right then we're not going to make the movie...You know that having a misogynistic guy in today's world, how do you make that fun and lovable and at the same time he's got to be an incredible badass, so those are the things that we're struggling with and we're going to try and come out with what I hope is a really fun ride. That's the goal, is for it to be a really fun ride." So, even though Platinum Dunes is currently working on bringing Duke Nukem to the big screen, it sounds like this is far from a guarantee at this point. 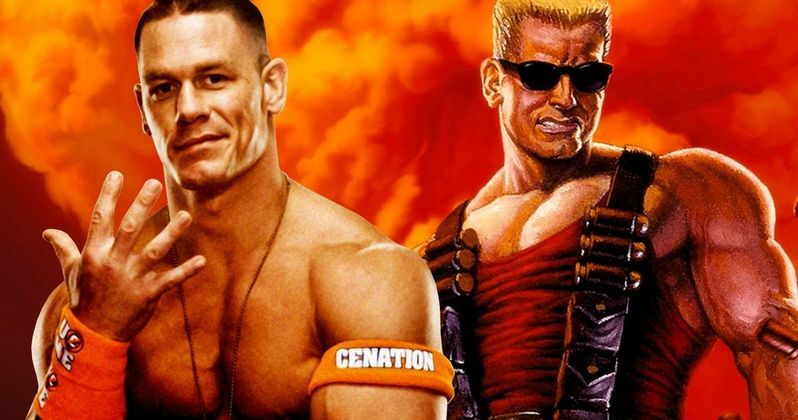 We reported in January that John Cena is attached to star as the titular character, should the movie actually get made. Cena has been progressing as an actor but hasn't got to lead a potential franchise on his own just yet. This could be his chance, but as Andrew From cautions, even though he's their guy, if he doesn't like the script, there's a chance it could fall apart. "Yeah, that's what we're working with now. He is. Yes. We don't have a script yet, so that is confirmed at this point but if he reads the script and he doesn't like the script I'm sure there's ways that he could pull out, but right now he's our guy." Currently, there's no release date for this Duke Nukem movie, but it's in the works and, if a good script comes through, it sounds like it's going to happen. Can John Cena make this more than just another Doom? There's certainly potential here, but until someone makes a video game movie that works (here's looking at you, Rampage), then it's going to be tough to get too excited. But at least it sounds like the producers have the right mindset. This news comes to us courtesy of CinemaBlend.